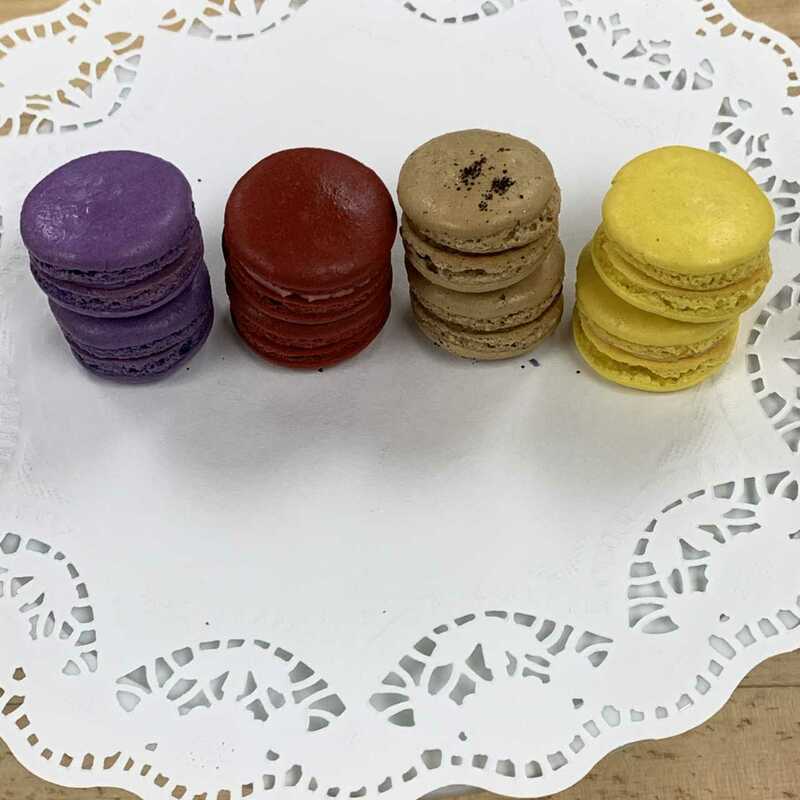 Frozen, traditional French Macarons. Assortment includes: Dark chocolate with coconut filling, Gianduia, Salted Caramel, Matcha Green Tea, Mango, Blueberry. Contains our classic French macarons, meringue based with butter cream filling. 25 coffee, 25 lemon, 25 lavender, 25 Door County Cherry. Gluten Free. Frozen. Our classic French macarons, meringue based with butter cream filling, chocolate with chocolate genache filling. 25 chocolate, 25 passion-mango, 25 almond, 25 raspberry Gluten Free. Frozen. Our classic French macaron, meringue based with almond butter cream filling. Gluten Free. Frozen. Our classic French macaron, meringue based with Callebaut Chocolate ganache filling. Gluten Free. Frozen. Our classic French macaron, meringue based with coffee butter cream filling. Gluten Free. Frozen. 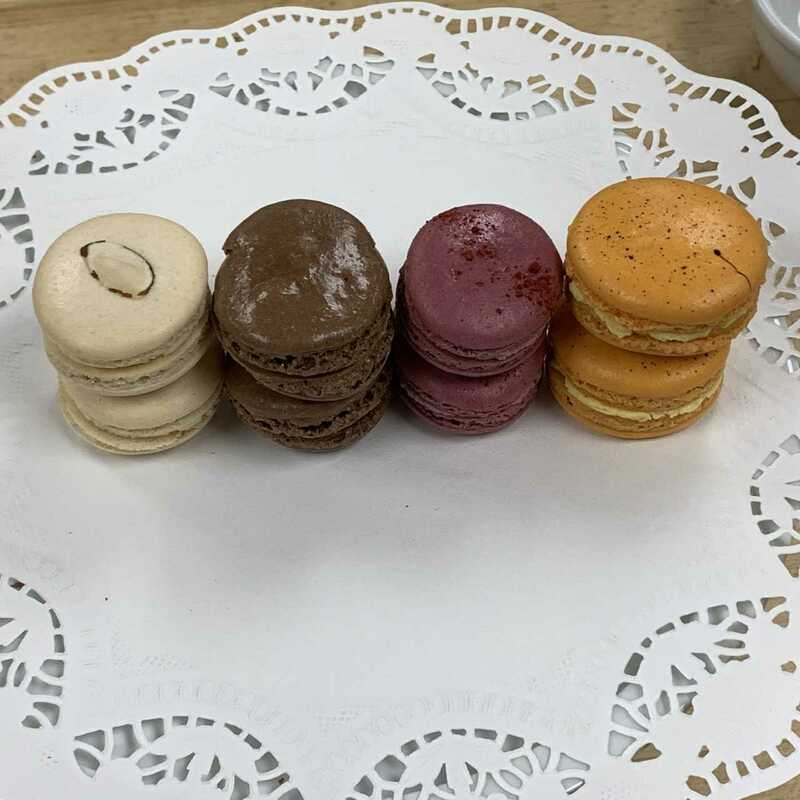 Our classic French macaron, meringue based with Door County Cherry butter cream filling. Gluten Free. Frozen. Our classic French macaron, meringue based with lavender butter cream filling. Gluten Free. Frozen. Our classic French macaron, meringue based with lemon butter cream filling. Gluten Free. Frozen. Our classic French macaron, meringue based with Boiron mango-passion butter cream filling. Gluten Free. Frozen. Our classic French macaron, meringue based with raspberry butter cream filling. Gluten Free. Frozen. Two light almond meringues sandwiched around flavored cream. Six flavors: Venezuelan Chocolate, Orange Lemonade, Toasted Pistachio, Cafe Latte, Passion Fruit, and Strawberry Fields.